Steve Cunningham rematches Yoan Pablo Hernandez after a controversial 2011 loss. A brutal knockout, an early stoppage and possibly a points robbery - Steve Cunningham and Yoan Pablo Hernandez have some issues to resolve after their last fight. In October Cunningham took his IBF belt to Germany to make a defence against Hernandez, who is undefeated since 2008. For six rounds it was so close that we expected the second half of the fight to heat up, when both fighters would be struggling for the win. We never got to see how it would have ended; in the middle the ringside physician threw a paranoid fit and ended the fight. The doctor took one look at the cuts on Hernandez's face, there thanks to a headbutt, and called off the match. What a joke. The cuts weren't affecting him and there was no sign he wasn't in the fight. By ending the match early the physician handed the reigns to the ringside judges and their trusted scoring abilities. Enter controversy number two. The judges scored it 59-54. 58-55 and 56-57 in favour of Hernandez, giving him a technical decision win. These poor scores were influenced by Hernandez's knockdown of Cunningham. A Yoan Pablo Hernandez iceberg sunk the USS Cunningham to the seabed in the maiden round, and it was brutal. Even worse, Cunningham fell again whilst scrabbling to get up. Once his head cleared, Cunningham got himself back into the fight and even if you didn't have him winning, there's no way he was five rounds behind. A premature stoppage and dubious scorecards lost Cunningham his IBF belt but now he has a chance to take it back. He and Hernandez meet again in Germany on February 4th and there's good news for UK fans, because the fight is on BoxNation. It's a first-rate event for the new channel and good to see after a poor start to 2012. As far as the fight goes, it's difficult to call. The six rounds we saw last year told us nothing other than that the two are evenly matched, but if I had to make a call, I'd go for Cunningham. Hernandez's knockdown of Cunningham proved he has the power to upset the former champion, but his 50% KO record doesn't suggest fists of steel. Cunningham is going into this pumped-up and ready to right some wrongs, and I can see him out-pointing Hernadez in what will be one of the last major victories of his career. Punchbag Blog's pick is Cunningham by unanimous decision. The undercard has two fights signed on, both EBU title matches. The first is cruiserweight bout between Enad Licina and Alexander Alexeev. Licina's record is 21-3 and Alexeev is 22-2. 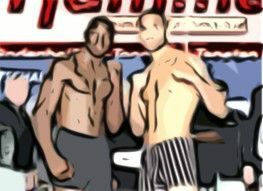 They're both early thirties, over 6' tall and neither has had a big win. You can take your pick on the winner of that one. I tossed a coin and it came up Alexeev. The second sees light heavyweight Eduard Gutknech take on Vyacheslav Uzelkov. Both men are past the point where they could be world contenders, with Gutknecht 29 and Uzelkov 32. Gutknecht lost a title fight two years ago against Robert Stieglitz and Uzelkov lost out to Beibut Schumenov in July 2010. Uzelkov's best days are behind him and I'd expect him to lose on Saturday. The Cunningham - Hernandez main event is enough to make this a watchable card. Who do you think will win?